When it comes to table lamps, wood lamps and wooden table lamp fixtures are always a great choice from walnut to honey wood, and cherry wood to natural, there is a wooden table lamp that will serve you in our selection of inexpensive table lamps. 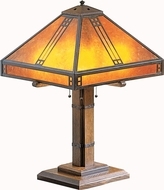 Wood fixtures and wood table lamps come in shapes, including hexagonal, bamboo shaped, lathe cut, mod, urn and many more, with fabric shades featuring fibrous paper, translucent semi-glass, and wood trim for every wood table lamp. 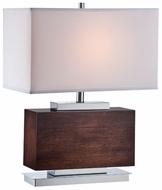 Wooden table lamps with steel accents are excellent for that transitional design that blends into any décor, and if you are looking for a more contemporary table lamp, wood lamps with these accents are perfect table lamps. 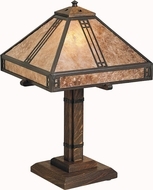 Wood lamps, such as these, are perfect for desks, end tables, bookcases, studies, and bedroom lighting. Always in fashion and never dull, the best wood table lamps will brighten up any space; and when you buy wood table lamps from us, wooden table lamp sale, you will get the most affordable wooden table lamps from the largest wooden table lamp selection online shipped right to your front door. If you want a discount table lamp, wood is your best choice, and if you want a great wood table lamp sale, buy wooden table lamps from us and skip the disappointing selection of cheap table lamps at big box stores and home improvement warehouses.